Frank’s original drawings, all of which are based upon the chestahedron and its transformations, are available in high-quality originals. These drawings are completely new to the realm of sacred geometry, standing as important contributions to this most-ancient realm of human knowing. Blending the precision of geometrical form with artistic impulses of the spirit, Frank has created truly beautiful works of “objective art”. Read more below or click an image to make it bigger. The stars in the original works are made from actual gold leaf, and a special gold powdered dust from Japan is sprinkled around the forms as well. The black paper, also specially ordered from Japan, also has gold embedded in the paper. Terms: All shipping on the originals is free. Please allow ~two weeks lead time for the originals. If you need to discuss special financing arrangements, please contact Frank directly at fchester7@gmail.com. These five originals (01-05) show the axis geometry found in the human heart. The first original (01) shows the discovery of how a new star is created by integrating a pentagram (a circle of five) and a heptagram (a circle of seven). 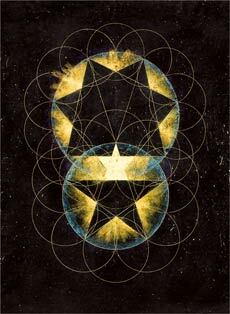 The second two originals (02-03) show the afterimage of the star as it moves around a lemniscates of two circles. The viewer can now experience where the stars are found in the two circles. 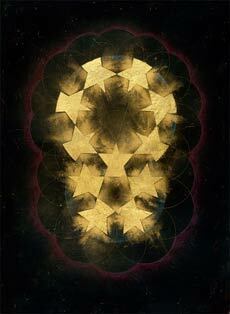 The next two originals (04-05) show all the stars becoming a composite view of the heart geometry. The idea behind all five originals are that the human heart rejoices when life is experienced as a rhythmic weaving between peripheral and centric polarities. Contemplating any of these prints is a lawful moving way of experiencing the metamorphosis of light, which helps to heal our heart. 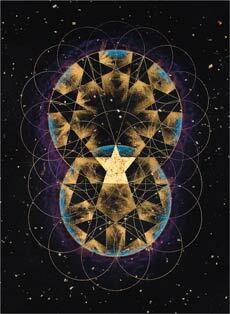 They are healing cosmic geometries. View all five original in a meditative sequence here. 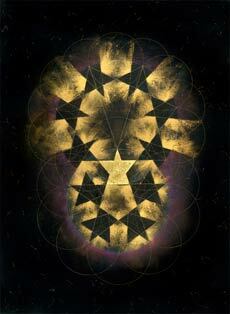 This geometry is the most profound newly developed configuration in the 21st century. Never before has a circle been divided into seven equal spaces using a pentagram as its base. Diameters of two circles and the distance between their centers derive from the Chestahedron. In between these two circles, inside the Chestahedron, there is a cube that separates them. The distance between the centers of both circles is in a ratio of root 3 to this cube if it had a side with a length of 1. Now a pentagram can be drawn in the smaller circle and by projecting the top point of this star until the lines reach the larger circle, a Heptagram can be constructed. This geometry has produced a new star, yielding twelve stars circulating in a lemniscate focusing on the “center” and “periphery”. The new star is the one that is simultaneously moving within both circles in balance between the centric and the peripheral forces. Thus, where this star is created in conjunction with both circles there are really two stars in the same space (one from the centric side, one from the peripheral side). 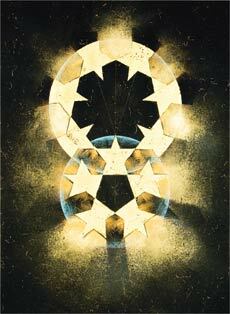 It therefore appears that there are only eleven stars, while in actuality there are twelve. See how this geometry creates a cyclical relationship between the numbers five and seven in this animation. Frank is an artist, sculptor and geometrician based in San Francisco. 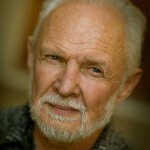 He has taught art for more than thirty years in high schools and colleges. Since encountering the work of Rudolf Steiner, Frank has been exploring the relation between form and spirit. This site is a space to share his research with the public. See also his medically-oriented site: Heartistic Science. ©2013 New Form Technology. All rights reserved. Site by Spirit Alchemy Design | Powered by WordPress | Built with the AutoFocus 2 Theme.